I traveled to Singapore in late June for the first time in two years. In addition to famous tourist areas, I went around spots I have never been to before this time. While I have lived in Singapore for a year and half before, I find something new whenever I revisit Singapore. In this article, I will write about evening scenes of Marina Area (Marina Bay Sands etc.) as part of Day 4. * Day 5: library@orchard etc. I returned to Marina Bays Sands, which I visited in the day time (see the related article). From a promenade connecting with Gardens by the Bay, visitors entered into Marina Bays Sands with an escalator, so I enjoyed different angles. I found evening atmosphere in Marina Bay Sands was different from the day time. I went out of the building from the central entrance for the time being. The Louis Vuitton outlet was shining. I entered into the building again. I took snaps photos just randomly, but found all of the spots were fancy. 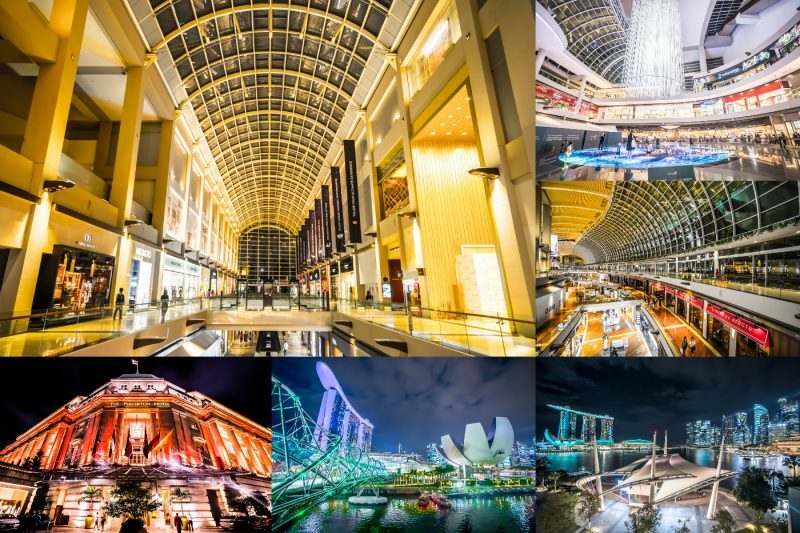 If you are a wide-angle lens lover, I recommend Marina Bay Sands. “Digital Light Canvas”, a new attraction co-developed with “teamLab”. When I visited “Digital Light Canvas” in the day time, there were few people playing in the circle, but this time I found several families there. Then, I left Marina Bays Sands. I took several photos on the way to the hotel. If I had had more time and energy, I would have took photos with tripod. However, I was tired through a long-hour walking from Marina Barrage, so I took photos quickly with hand-holding. To begin with, “Helix Bridge”. View from “Helix Bridge” with Marina Bay Sands and ArtScience Museum. I revisited the Roof Terrace of Esplanade, which I visited in the day time (see the related article). It seemed the venue was one of the famous spots for couples. Although I didn’t take photos in the day time due to bad weather, “Esplanade Outdoor Theatre” was also impressive. “Fullerton Hotel Singapore” on the right. “Marina Bay Sands” on the left. I took a photo of durian-shaped Esplanade from some distance. I will move from Esplanade to Merlion Park via Jubilee Bridge. When I crossed the bridge, “SPECTRA”, a light and water show, started at Marina Bay Sands. Merlion and Marina Bay Sands. Merlion with the background of office buildings in the financial district and Fullerton Hotel Singapore. Fullerton Hotel Singapore is located near Merlion Park. The hotel was lighted up in red. Finally, I took several photos of art-related facilities around the hotel. For example, “The Arts House”, which used to be the Parliament of Singapore. This is “Victoria Theatre & Victoria Concert Hall”. There was also a statue of Stamford Raffles. Last but not least, “National Gallery Singapore”, which I visited two years ago (see the related article). Then, I returned to the hotel and the fourth day of my Singapore trip was over. That’s it for the article about evening scenes of Marina Area (Marina Bay Sands etc.) as part of Day 4. In the next article, I will write about “library@orchard” etc. as part of Day 5. Revisit Singapore Part 17: library@orchard and National Museum of Singapore etc.